Hi, everyone! It’s already the end of the week and this is only my second post. I got home from Virginia on Wednesday. My nugget and I had a great time! We went with my BFF and her family to Jamestown and the Outer Banks in North Carolina. My son had a good time actually socializing with other kids. He cried terribly as we were leaving home. A few days in VA and he was asking if we could stay longer! 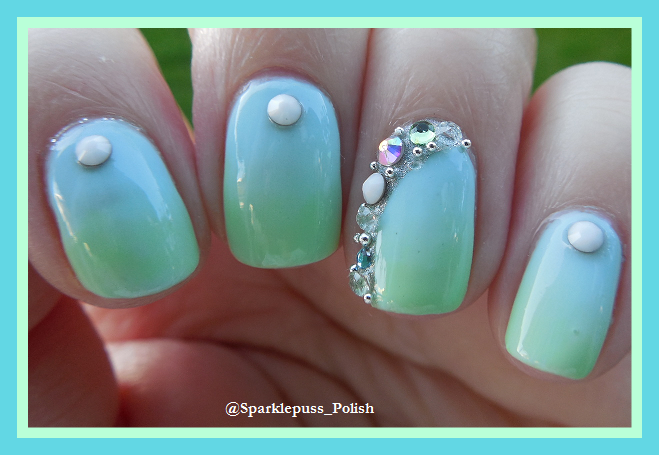 Today I’m goin to the beach in New Jersey, so next I’ll have some beach nails to show you! So as you may remember in my last post, I did beachy nails for my trip, but they ended up popping off. So this is the mani I did for my trip at the last minute. For this, I started with two coats of Sugar Cube by Salon Perfect. I then did 2 coats of Equestria Games, which is a lemon yellow, green-leaning crelly with pink shimmer. Over top of that, I did one coat of Crystal Empire which is a topper with pink shimmer and iridescent glitter. It was really hard to capture the overall effect of these. My son and I stopped in BK to grab something to eat and my nails were much admired there. I was really satisfied with the look of this mani. It was really pretty and eye catching. I’m just bummed I couldn’t get a truly accurate photo of it. Well, it’s good to be home and back at the grind here. Me too! I wish the shimmer would show up on camera better! Ooohhh loving this shade of green! It’s a really great shade of green! It’s beautiful on you! I love the iridescent glitter topper! This makes a cute combo.